Stardust Memories sees Woody Allen at his most reflexive, Fellini + Bergman worshipping mode. By the film’s end, I found myself frustrated with the similarities to 8 1/2, but when does homage turn into downright rip-off? Even if it isn’t original, this transgressive film from the funny New Yorker is on of the best in his early, middle-career period. Allen stars as pusillanimous, token-neurotic filmmaker/leading man Sandy Bates. Sick of creating the sort of comedic tripe that has made him a universally reknowned figure, he premieres his latest, more serious movie at a weekend film festival dedicated to honouring his alleged genius. Amongst the new admiration from artsy types, and harsh criticism from mainstream patrons of his “earlier, funny films”, Bates’ artistic flare is quashed by his run-ins with the three women in his life – the married French mistress Isobel (Marie-Christine Barrault), intelligent new flame Daisy (Jessica Harper), and the sweet ex-girlfriend who haunts his subconscious Dorrie (Charlotte Rampling). It’s interesting to see Allen being his harshest critic. Following on from his first foray into serious filmmaking with Interiors, and the career best/his most hated movie Manhattan, Stardust Memories is Allen’s lucid critique of stardom and celebrity. 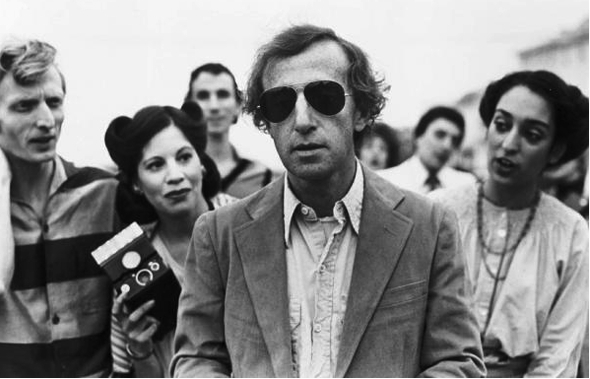 Throughout the film, we see Sandy stopped every thirty seconds by an adoring fan, desperate for a photo or autograph, a fledging writer wielding a script in front of his eyes, bigshot producers wanting a piece of Sandy’s lucrative pie, or a flirtatious young plaything wanting one night of steamy passion with…Woody Allen. It may sound tiresome and egotistical, but Allen is wryly, and boldly sidestepping the industry that has made him a household name, and looking at it through a wide-angled lens for all it’s sycophantic ugliness. Like many of Allen’s films, Stardust Memories lacks a cohesive narrative drive, which often ends up leading to absurd asides or irreverent sketches. On the most part, it all comes together pretty well (one with a fantastical monster that embodies Sandy’s subdued anger and goes on a murder hunt is particularly great). Bates/Allen has space to massage his ego, or self-deprecatingly wear it down, but such erratic focus on this one complex individual means that the ancillary characters – i.e. the women – are slight. The ravishing Rampling in particular is criminally underused as a pretty marionette device for Sandy to go reflect on the life he once had. It’s the most divisive, pretentious and borderline grouchy movie I’ve seen of Allen’s to date, but Stardust Memories is still a hilarious, cathartic exercise on the magic of the movies, and the hardship one goes through to make them. This entry was posted in ★★★★☆ (4) and tagged amy wright, Charlotte Rampling, daniel stern, Fellini, felliniesque, helen hanft, ingmar bergman, interiors movie, jessica harper, john rothman, leonardo cimino, Manhattan, Marie-Christine Barrault, Stardust Memories, tony roberts, wild strawberries, Woody Allen. Bookmark the permalink.